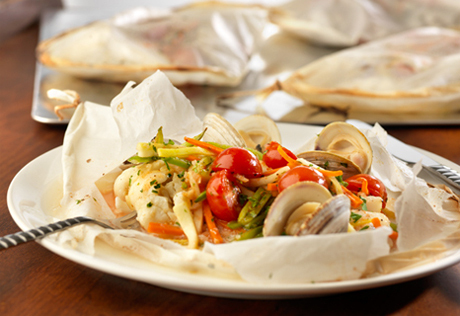 This French-inspired dish steam-bakes tender, delicate flounder along with fresh vegetables and clams….each in its own individual packet! The secret ingredient is spicy vegetable juice that adds just the right amount of zing to this incredible meal! Heat the oven to 425°F. Place the carrot, snap peas, squash, tomatoes, shallot and garlic in a large bowl. Add the olive oil and parsley and toss to coat. Season with the salt and black pepper. Trim 4 (about 12-inch) parchment paper squares into heart shapes. Brush the parchment hearts with vegetable oil. Place 1 fillet fish on the left side of each parchment heart. Season with the salt and black pepper. Divide the vegetable mixture among the fillets. Spoon 2 tablespoons vegetable juice over each. Place 4 clams around each fillet. Fold the right side of each parchment heart in half over the filling. Fold 1/4 inch of the edges of the parchment paper over twice towards the center to seal and enclose the filling. Work from the tops of the hearts around to the points, twisting the points and tucking them under. Place the packets onto a baking sheet. Bake for 10 minutes or until the fish flakes easily when tested with a fork and the clams open. Recipe Note: This recipe was developed using 1/2-inch thick flounder fillets. Thicker fillets may require additional baking time.